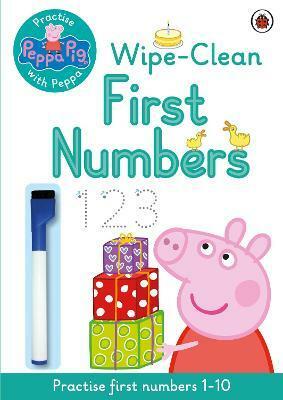 Develop and practise first number skills with Peppa Pig and friends in this colourful wipe-clean activity book. Children will learn how to write the numbers 1-10 and begin to link number words with the numerals (one = 1) through a range of fun Peppa-themed activities. Ideal for young readers who are starting school and developing first number skills and pencil control. Children can wipe the page clean and practise again and again. Includes a free pen. For more confident learners, why not also try Practise with Peppa: Wipe-Clean First Counting to practise numbers up to 20?